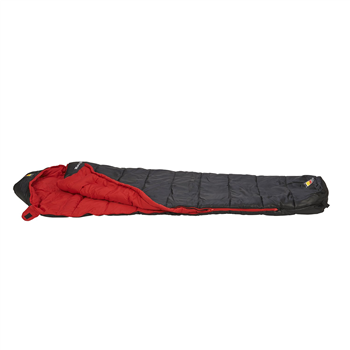 The Mistral range of synthetic sleeping bags has been designed for those looking for reliable gear within a budget.The Mistral 450 is for spring and summer use and suitable for D of E and Scout and Guide use. To keep out the draughts, the sleeping bag has been fitted with locking zip sliders to keep the zip in place and prevent it from creeping open during the night. Shoulder baffles help to retain warmth and there's also a drawcord closure for an extra snug fit. When it is time to get in or out, zip guards prevent the slider snagging and an 'up and over' zip pull makes it easy to zip or unzip the bag from inside or outside. Made using single channel, hollow fibre insulation with a double layered construction on the top and bottom to optimise heat retention. Close fitting hood with drawcord closure.Shoulder baffles. Water resistant treatment on outer shell.Internal pocket. Locking zip sliders. Up and over zip pulls. Hanging Loops at the foot of the bag for airing and drying.